Have stacks of old computer equipment gathering dust ? Now you can put some of it to use! 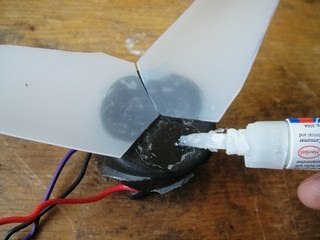 This guide shows you how to use PC fans as mini wind turbines, for recharging solar lights and ni-cads. 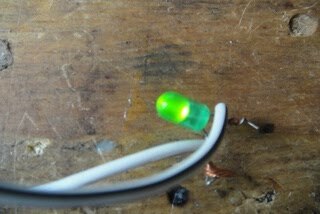 You'll need some basic soldering skills, but this is otherwise a very easy project. 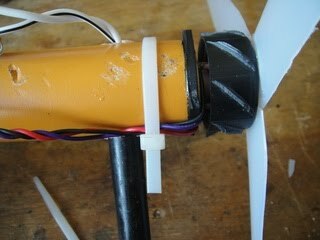 My little wind generator makes around 1.5 - 2V in a 8mph wind, about 20ma into a ni-cad. Old PC fan, bigger the better! Two lengths of steel tubing that slide inside of each other, about 1/2"
Normally these fans are held together by a little circlip. This is hidden under a seal on the back of the fan. Remove the sticker, and prise the little rubber seal off. This should reveal the circlip, you can prise this off with a little screw driver. You should be able to pull the blades off now. 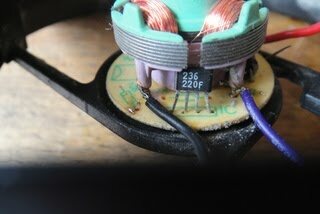 Look at the copper coils on the fan, there should be two or three wire legs, these are the connections to the coils. One of them will have two pieces of copper wire connected whilst two have only one piece of copper wire connected. You want to solder two wires to the legs with only one copper wire.There should be just enough metal showing to solder onto. Prepare two lengths of insulated wire by tinning the ends. Solder these onto the coil legs. With the wires soldered, you can remove any electronic components from the board. I just snipped the legs with some mini wire cutters. The rectifier turns the AC output into useful DC power. You need 4 diodes for this. Snip the legs on two of the to about 1cm on the side with the black line, and three to about 1cm on the side without the black line. Bend the long pieces over to connected them all together (see photos). Solder them all together, then solder the three wires to where the two diodes are connected together. When you've finished the rectifier together, you can add the output wires. I used about a meter of bell wire, you can adjust this to suit your needs. You can test to see if the alternator is working now, fit the blades back into the fan and connect an LED or multimeter to the output. Give it a good spin and see if it works! After you've tested it (and it's working!) you can remove the outer plastic case and the blades of the fan. You can just snap the blades off, I cut the supporting parts of the box casing with wire cutters. The blades are cut from a thick plastic bottle - normal plastic drinks bottles won't work here, it needs to be thick plastic like that found in bleach bottles. Cut the top and bottom off the bottle, this. I made a template on paper and traced this onto the plastic. Make sure that the blades are all the same. 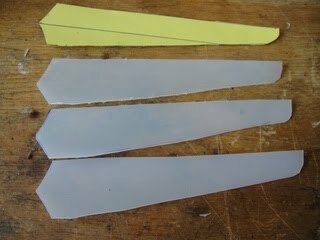 There was no particularly scientific design to the blades, I just made them as long as the plastic would allow, and a rough "blade" shape! 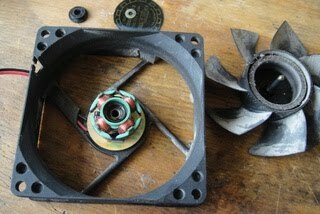 The three blades are glued to the plastic hub of the alternator. If your wondering about the angle of the blades, I found that the natural curve from the plastic bottle works fine, it doesn't need any angle adding. 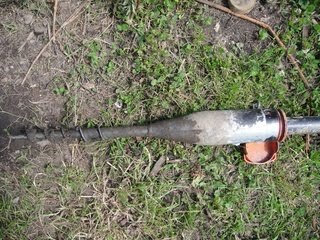 The motor is glued to a piece of wood which pivots on the steel pipes. The tail is made from an old CD. Drill a hole the same size as the steel tube all the way through, if it's a loose fit, you can epoxy it in place. Then I cut a slot in the other end for the tail, this should fit the CD. With the CD in place, I drilled two holes through the wood and through the CD, these are for the screws. Make sure you drill through the CD as so it doesn't shatter when you screw the screws in. Now you can mix up some epoxy to glue the alternator to the end of the wood. When it's glued in place you can zip tie the wires securely, and thread the output wires through the tube. I zip tied the rectifier to the underside of the windmill, and sealed around the connections with some epoxy, which should keep it corrosion free. Here's what I use for my tower, it's a garden "corkscrew" type thingy-ma-jig. I don't really know what it's called. It's great for supporting small towers for mini wind gens, only £4 from lidl too. 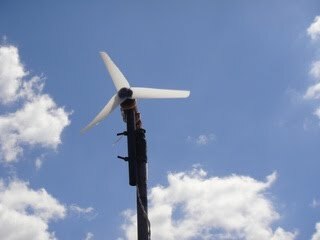 The actual tower is a piece of thin wall tubing with the larger tube zip tied to the top, for the bearing point of the wind mill. Two of the coil wires are connected together, I just followed the original wiring from the PCB.